Biking in Turkey is the cycling division of Middle Earth Travel: a fully registered travel agency with Turkish Tursab licence accreditation No. 3242. With more than a decade of adventure travel experience, enthusiasm and extensive local knowledge we are the best people to advise you on your Turkish cycling holiday experience! Middle Earth Travel is a small business run and staffed entirely by enthusiasts. We want you to have the most memorable, most amazing two wheeled adventure of your life!!! JON BAWN- Biking in Turkey Co-ordinator and Guide. Growing up in rural Devon, UK, Jon fell in love with bikes as a toddler and this passion and spirit for adventure and challenge has never left him. Now an expert mountain biker and experienced guide, Jon in fact studied music at university and has travelled widely. 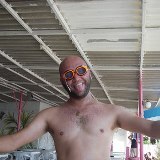 He is an outgoing, friendly character, and speaks French as well as Turkish. 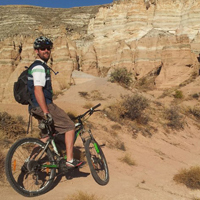 He is qualified to the British MBA Trail Cycle Leader standard and has lead tours all over Turkey. Bilal is a true legend of Turkish cycling- 12 times Turkey Champion and 4 times Balkan Champion he is the only Turkish cyclist ever to represent the national team at the Olympic Games. Experienced in the pro arena at top level road and MTB racing, Bilal is also a highly competent guide, expert in trail skills, first aid, tour operations and equipment maintenance. 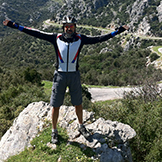 SINAN BEDEVI GUVEN – Turkish Road Biking Guide Hailing from the Turkish Aegean Coast, Sinan began cycling relatively late in life but a love of the countryside has taken him many thousands of kilometres around his native Anatolia. He is a reliable, genuine and calm character with a great sense of humour- a pleasure to cycle with and a wealth of knowledge and experience. He’s at home most on the open road, but is fast developing his trail skills in Cappadocia. 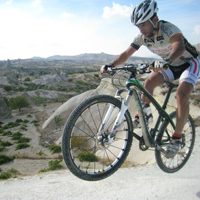 HAMI BEK- Turkish MTB Guide Based in Goreme, Cappadocia, Hami recently graduated from Nevsehir University with a degree in Tourism Management. He is a fully certified cultural and historical guide as well as a highly competent mountain biker. Hami has great energy and warmth of character, is a proficient instructor in singletrack skills and with his ever growing knowledge of his country’s history, culture and politics is able to make tours educational as well as fun. 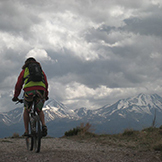 ENGİN HINÇER – Turkish MTB Guide Engin is a nature lover. 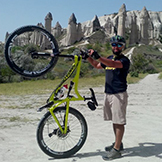 Living on the west coast of Turkey but becoming increasingly addicted to biking in Cappadocia, Engin’s passion for outdoor sports ranges from singletrack biking to scuba diving. He is a professional outdoor and underwater photographer and has been guiding outdoor and adventure sports since 2009. He is also an EFR (Emergency First Response) instructor and is fluent in English and Turkish. Born in 1973, Atil has been in tourism since high school and he has been leading trekking tours since 1997 and running Middle Earth travel for over 16 years. He is the father since July 2009 of a beautiful girl, fittingly named Su Peri (Water Fairy). He has a B.A. degree in Philosophy and his knowledge of history on Asia Minor is remarkable. His detailed planning and perfectionism makes our tours very well organized throughout. PLEASE NAVIGATE TO THE BOTTOM OF THIS PAGE AND LEAVE A COMMENT AND WE’LL GET STRAIGHT BACK TO YOU! Click here to go to the Middle Earth Travel homepage (for trekking, mountaineering, special interest etc). I’m interested in the West Aegean Explorer Road Cycling Tour : few questions. Would it be ok to start Saturday 7th October? Two people me and wife Jules. Can you give details about route navigation and bikes for rent for this tour though may bring own bikes? That will do for a start! Hello Sirs. Very interested in a one day MTB tour visiting the best sites. We are a family of seven (parents 53 and 50 and 5 kids ages 16, 20, 22, 24 and 26) plus my son ‘s girlfriend (22) for a total of 8. We would need to do the tour sometime between July 17 and July 19. Please advice on your recommendations. Everyone is in reasonably good shape although not everyone is highly technical (only a few of us) on the bike. Can i just hire a bike from you for the day and explore the trails myself, without the tour? What bike brands/types can we hire out to ride on your tours? We are considering both road and mountain cycle tours. Hi Annie. We have high quality bikes from Specialized, Trek and Sedona (the top Turkish brand). If you’d like full details of models, sizes etc please let me know!